This week Cath brought a bunch of games to give away free to a good home. This is the kind of thing you're missing if you're not coming to IpBoG! I started the night with Codenames. I'm generally bad at this game but sometimes slow and steady wins the race and my team managed to win in all the rounds, even when I was the spymaster. Afterwards we played a quick game of For Sale which Cath won followed by the main event, Onwards To Venus. Like Mythotpoia from the previous weeks this is another Martin Wallace game that I picked up for cheap. It's is a kind of area control game set in some steam punk style alternate history universe that I've never heard of but is allegedly slightly famous. I preferred this game to Mythotopia but I won so I would say that. In all honesty it seemed less generic and fiddly and more like something I'd play again rather than something which will probably sink to the bottom of my cupboard. Machi Koro was played along with the Millionaires Row expansion which Phillip said was an improvement on the base game. 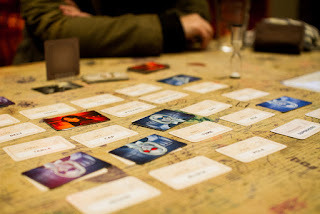 Eight Minute Empire: Legends was also played which Phillip also said was an improvement on the base game. 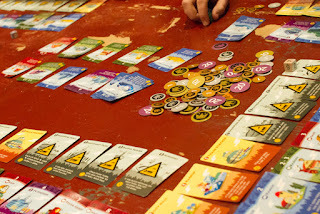 Others played Mafia de Cuba, Pit, Spyfall and Arctic Scavengers. Remember next week is our two year anniversary and so we'll be having a two player game night so make sure to bring all your best two player games. Or at least your games that work best with two players.